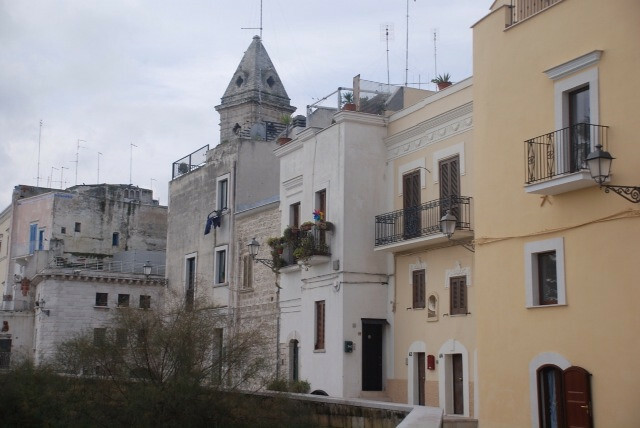 We arrived in Bari after an overnight ferry from Igounamitsa. As usual, I got seasick but this time wasn't too bad compared to the last time by 'supercat'. After going through immigration, we took a taxi to find a hotel. This was probably a bad idea as he drove us on the scenic route before deciding to turn around and drop us at a B&B which ended up being only 4 minutes walk from the harbor. Anyway, the B&B was very reasonable and cute, the owner was a young woman who couldn't speak English but it worked out somehow with lots of smiles and gestures. We got a good deal for a one night stay. Her husband took us to the cafe near their house for breakfast. The standard of Italian or western breakfast is very much different compared to Vietnam. We had a simple breakfast of coffee/ juice, croissont and sugary donut but it was very nice. I've never been a big fan of espresso coffee but I decided that in italy I was going to try it. In Bari, I had my first but it was by no means my last! 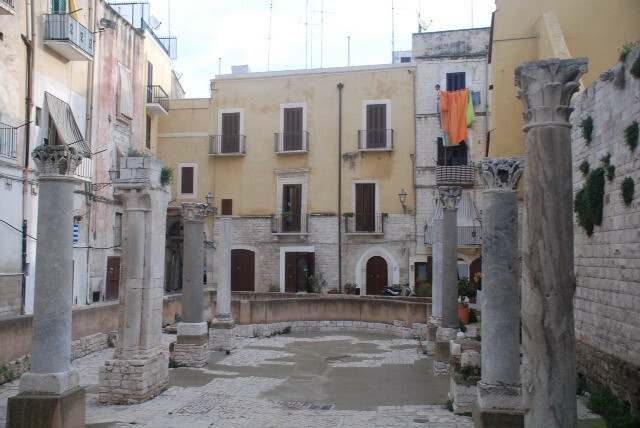 Bari is a reasonably sized city with a gorgeous old quarter which we discovered and got lost in the whole time we were there. We had arrived on a lazy Sunday morning, so there wasn't much going on except for a terrible trashy market selling crap from China. I suggested that we try some pizza even though it was only 10am. But we were in Italy. We had to eat something Italian to start. In the afternoon, we walked around the central square near the old fish market where people were hanging out to listen to some local bands singing. 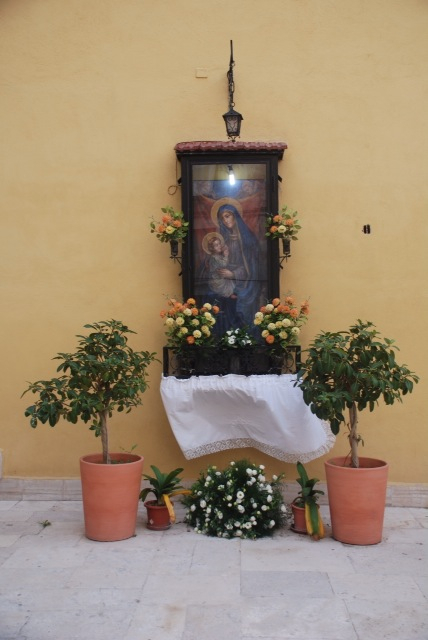 Amongst the cafes and restaurants,there are also several old beautiful churches. We tried some local fried polenta with salt on the edge of the square and sat down listen to the music. Sitting there for half an hour of so, watching the passing parade was really fun. Later at the old pizza shop, we ordered a volcano pizza, a seafood pizza and a margarita pizza and some beers. Again, it was very nice having pizza in Italy. They weren't the greatest but we were sure there would be more to come. The hotel owner offered to take us to the train station which was so nice of him. We were taking the morning train to Salerno, gateway to the Amalfi Coast and Pompeii. Salerno is a medium city with a spectacular old town and cobblestone boulevards, which we walked along on our first evening. It was lined with many beautiful clothes shops, restaurants and ice-cream shops. The mint chocolate and Baci ice-cream proved to be our favourites that night. 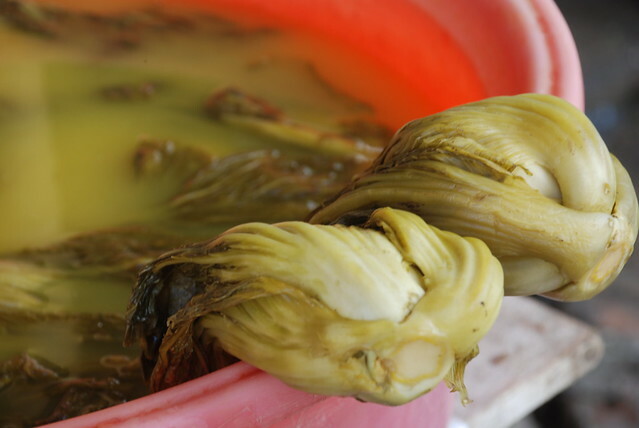 Most Vietnamese women in northern Vietnam know how to make dua ca (pickles) well and my mother does, too. 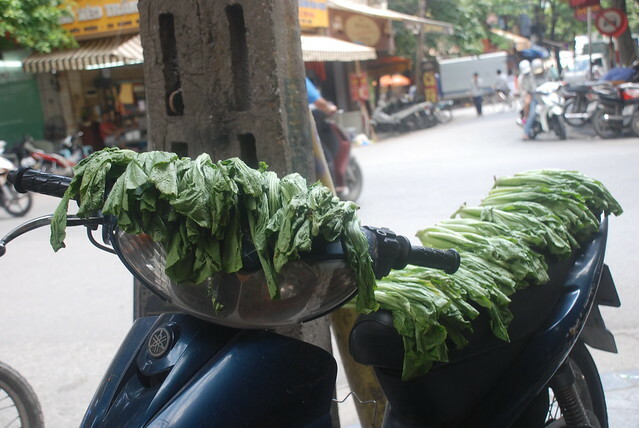 I have tried a few times when I was in Nha Trang but just couldn't make it right. 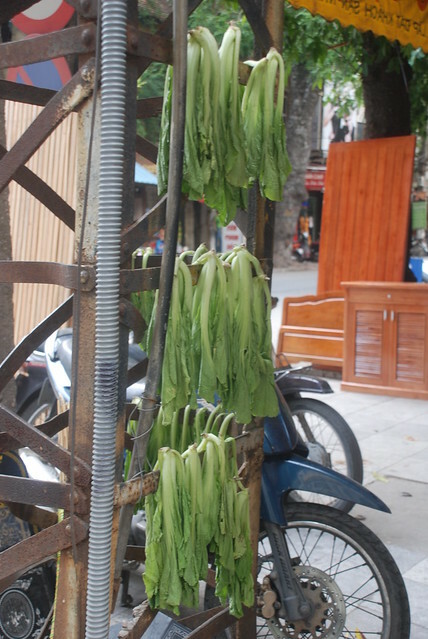 Today, I walked pass Hang Muoi street and saw an old woman making it and my mouth started watering. When I saw the woman hanging Dua vegetables on the side of an electric stand yesterday, I thought it'd be a great shot and I took a photo. Today, when I walked past again, she was sitting there making her specialty, going through the many different processes: the dried Dua veggies are laid in the hot sun for a few hours to wilt, after which they are well mixed with warm water and salt. They should taste a bit salty (no sugar is added). Lengths of spring onion are added and the Dua is ready to eat in 2 to 5 days. If you like the pickles a bit bitter then they can be eaten in a day. If you want to stirfry them, they are best after about four days of pickling. In Hanoi, many typical Vietnamese restaurants serve stir fried Dua veggies with garlic, a little bit of tomato or sometimes with beef. In my opinion, it's better without beef as it has enough favor; the bit of sourness from the veggies, sweetness from the tomatoes, a little salt from fish sauce or soya sauce. It's a perfect match for beer and to eat with steamed white rice. It's actually a nice option for vegetarians, too...if you can get it without the beef, that is. 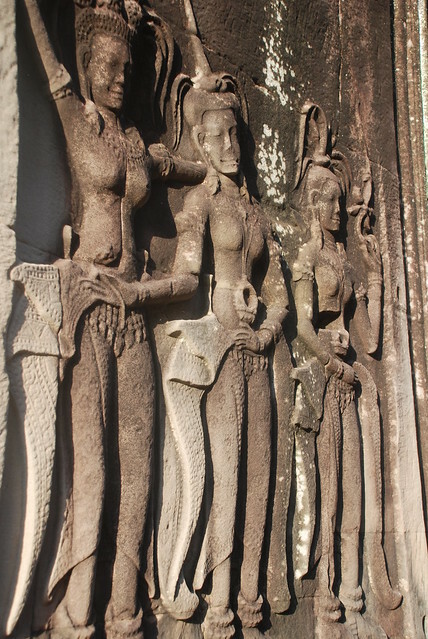 We left the hotel at 5 am and headed to Angkor Wat. As we approached, the sun was starting to rise up behind the amazing temple. The quiet of the morning and the early fresh cool wind blowing across our faces was a nice way to wake up. And what spectacular scenery. My mum said, "Angkor temple looks so beautiful and well maintained, why don't we have something as beautiful as this in Vietnam???" I told her that we have different things of beauty in Vietnam, from the north to the south, like the Cham towers, Halong Bay, and Phong Nha Cave, which are all world heritage sites, too. 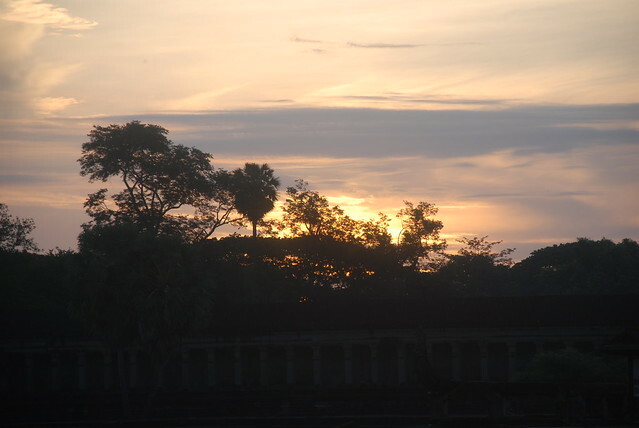 Anyway, we sat outside and watched the sunrise for about an hour, before walking into the temple to start our day. My main duty was explaining the site and taking photos for everyone. Thank god that I like photography and I enjoy doing this kind of work. My sister and my nephew love having thier photo taken and I spent most of the time focusing on them in different corners of the site. We walked toward the entrance and we saw a group of 30 very loud Chinese people talking to each other. We tried to avoid them but they seemed everywhere. I think this kind of place needs quiet for people to enjoy its peaceful beauty instead of shouting and arguing. 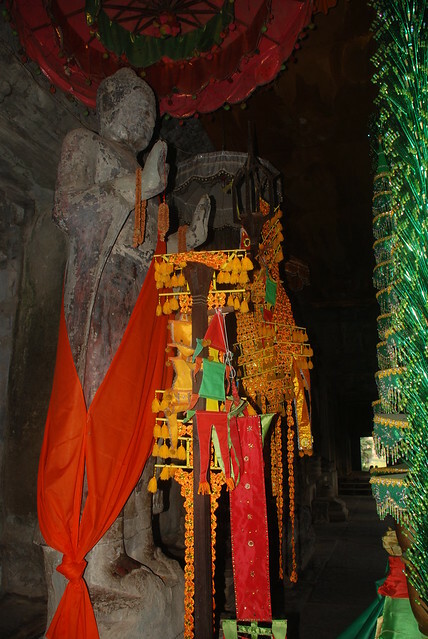 Our great regular guide Pheav next took us to Bayon Temple and he told us about its history when we arrived and offered us water that he had prepared in an ice container. We very much appreciated his attention to this kind of detail. I told my mother this is my favorite temple in Siem Riep and this is the third time I had been here, the first 2 times during my first trip last year. We were all wondering how people in that generation could make these amazingly huge statues and erect them on hilltops. We spent more than an hour wandering around and taking heaps of photos, of course!!! On the way out, we saw quite a few old women sitting inside the entrance chatting in their traditional costumes after finishing their prayers. I wish I could speak Cambodian so that I could have got some special information about the temples in Siem Riep and especially Bayon temple. Near the end of our time in Northern Greece, we arrived in Kastraki, the town at the foot of the world famous monasteries of Meteora. I was so excited to be there, to be able to visit this amazing landscape. We checked into a guesthouse nearby - run by a 60 year old Greek woman who had spent many years living in Australia - with fabulous views. Again, we were virtually the only travellers in town, which was kind of pleasant. We had the town to ourselves. While we were in Kastraki, unfortunately the weather was quite wet, forcing us to relax in the hotel for a couple of hours before walking down to the town for a wonder. We stopped at a small restaurant and had our lunch, the owner of which showed his upset face for no reason. May be he had an argument with his wife before we showed up. Anyway, we ordered a few dishes, tried to get a smile out of him and enjoyed his food despite it all. Back at the hotel we started hearing music and the owner told us that the next day would be a special anniversay of a famous Greek victory over the Germans. We drove up there to have a look at the preparations, the music and the kids dancing. At the window of the town ouzerie, we saw the owner singing and dancing to Greek music as he served a single customer dinner. We immediately decided that this was the place for us. He was totally pissed and hilarious but he had a very nice voice and also he cooked brilliantly. We ordered some grilled sausages, Greek salad of course and Ouzo. 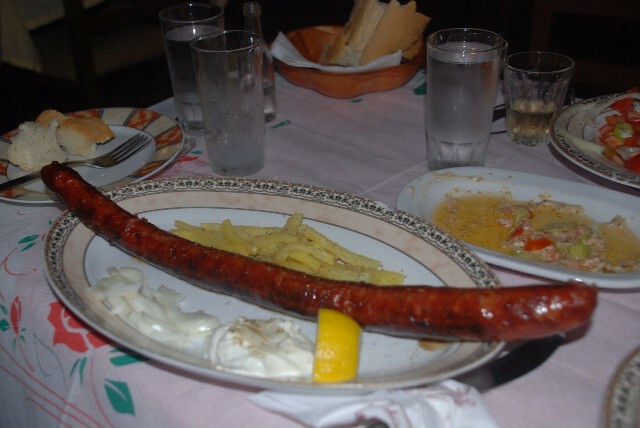 He served the longest sausage I've ever had in my entire life, too big for the dish and it tasted amazing. 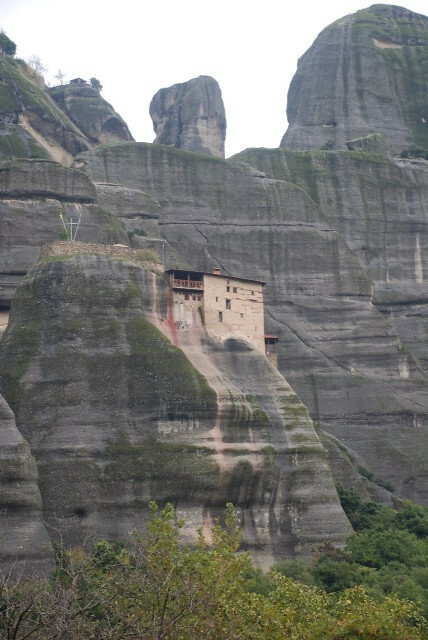 We started our monastery visiting the next day a bit earlier than usual as we wanted to visit as many as possible. Unfortunately some are closed on certain days. Anyway, we visited as many as we could and they were all amazing. I wondered at how the people could build so many monasteries that looked like they were hanging on the side of the rocky mountains. The walking paths up to them were beautiful both because of the view and the workmanship. After one visit, while I was waiting for my friends to come down, I talked to the ticket seller and he was so funny. He asked me where I was from and I responded. He tried to express that he knew Vietnam by acting out the shooting of a gun and said America and something else in Greek but I think he wanted to mention the Vietnam War. I'm so happy to know that at least someone in such a remote place knows about my country and he must know that we won the war. Thanks for that mate, I very much appreciated that. We had a brilliant day and yes, I can't believe I've been there. On our first day in Siem Reap, after traveling from Nha Trang, we relaxed for most of the afternoon at the hotel and then walked to the night market for dinner and a bit of shopping. We wondered around the night market for about an hour then we sat down at one of the many food stall around the area. We picked quite a few different dishes including rice, noodles and some stirfried veggies to taste the Cambodian style. As a chef, my sister loved Cambodian cuisine very much. 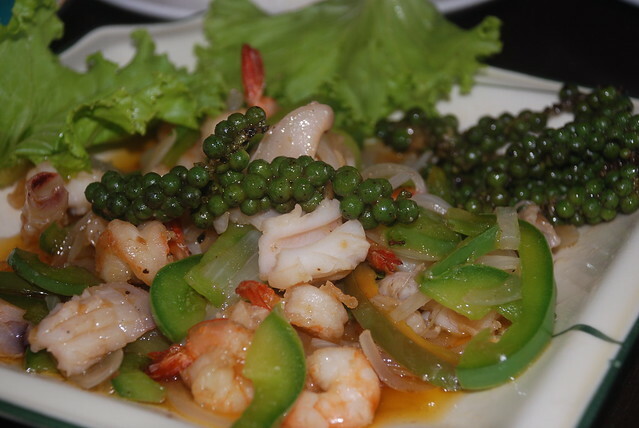 It's a bit similar to Vietnamese dishes but there is something special in their style. 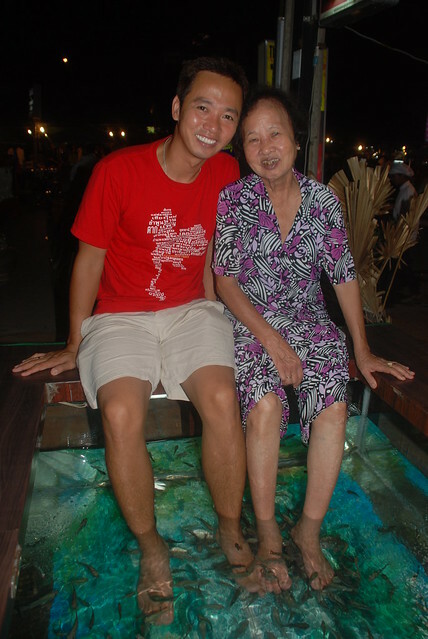 I encouraged my mum to try the fish massage and after a few refusals, she joined with us and she laugh so much. 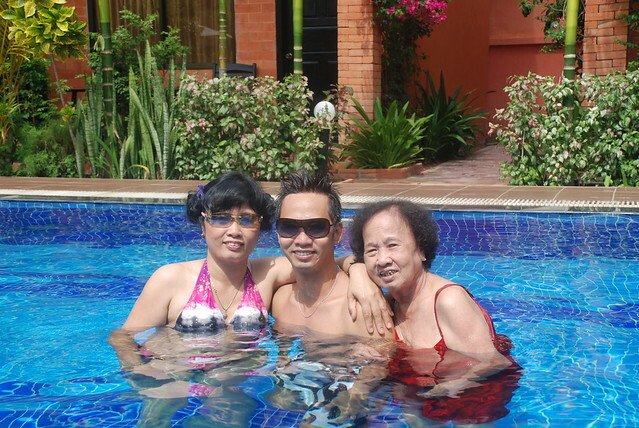 It is not very often that I see my mum so happy since my father and my eldest sister passed away. I realized, sometimes just a very simple thing could make somebody just that happy. I'm glad she tried a new thing like that. Mr Pheav, our great tour guide and tuk tuk driver came and after I took the family home, I headed to pub street to discover the Siem Riep night life. I stopped at a cafe and sat outside drinking a mojito and watched people walking past. I have to admit that there are heaps of prostitutes around, walking up and down trying to find clients. I felt bored after an hour and took a tuk tuk back to the hotel at 10.30pm. 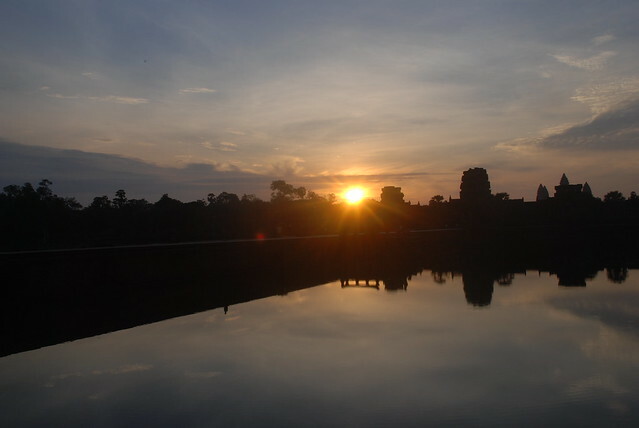 A sunrise tour to Angkor Wat was waiting for me and my family at 5am. I was sure my family would love this amazing view just I did the first time. My mum was still awake when I got back and my nephew was in the pool swimming. I joined him for a few laps then headed to bed. This is such a beautiful hotel, very quiet compared to crazy, noisy Hanoi. I was sure to sleep well before the early start the next day. 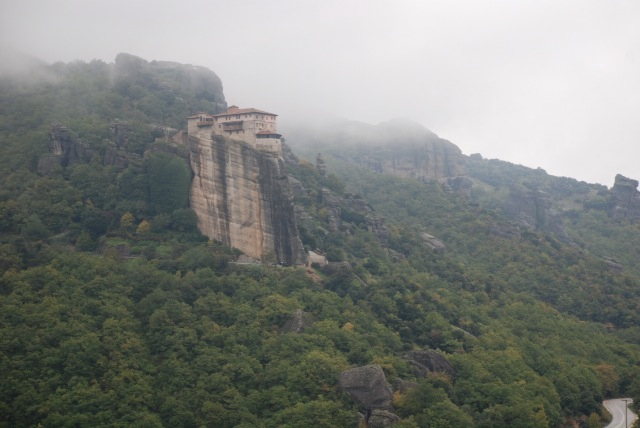 During my second trip to Greece we headed to the northern part of Greece, famous for its beautiful mountains and monasteries. I had heard a little about those amazing monasteries located on the side or top of the rocky hills and I couldn't wait to be there and enjoy the great views and the ambience. But before reaching there, we passed quite a few amazing places in the Zagorahoria area north of Ioannina. 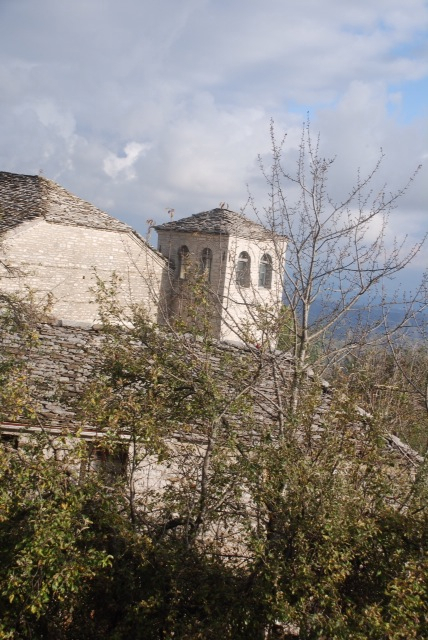 We visited Vradeto to walk up the renowned Vikos Gorge to view the beautiful scenery. We arrived a bit late in the tiny town after a long drive through the region. We parked our car at a small hotel and tried to work out when was the best time to do the hiking. We met the restaurant owner inside the place and a few of his regular customers eating and drinking wine. After a long chat, we realized that people only spent their summer time in the town to serve tourists and now being Autumn, there are only a few people staying in to take care of their houses. These regular customers were helping their relatives to build a house nearby. One of the young guy came over to our table and talk to us. He spoke very good English and we had a nice conversation. He explained a bit about the culture of the local area, the food and travel around this area. We decided to stay overnight and do the hiking the next morning. Unfortunately, there was no heater during the night (the temperature was only 3 to 5 degrees). We were the only people in the restaurant and the owner gave us extra blankets and it wasn't too bad. I went down stairs in the morning to ask for hot water to clean my face and the owner was already in the kitchen preparing our breakfast. He's a really funny man and a really good cook and we enjoyed his food very much. It took us 45 minutes to walk up to the Vikos Gorge, truly beautiful even along the walk. 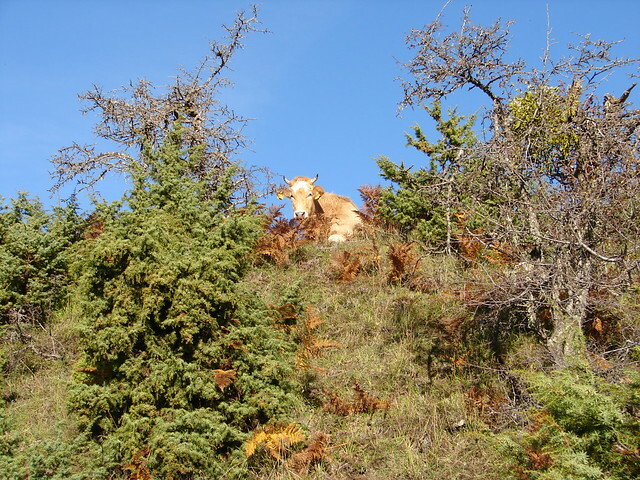 There are quite a few different animals accompanied by their keepers walking up the mountain with us as well, cows with bells, deers, dogs... Very nice and peaceful atmosphere. We stood up there for a while enjoying the cool fresh air, the view and took some photos. Absolutely love this place heaps!!!! We walked back to the restaurant and headed further north to Kastoria, on the edge of western Macedonia. After checking into a B&B, we drove outside of this pretty town on Lake Orestiada. We wanted to visit the Prespe Lakes region, which sits right on the border of Greece, Macedonia and Albania. We reached a small village where we saw a man selling different pickles in jars and they tasted so nice. We walked toward the end and we found a restaurant for our lunch. We had to admit that we had the best meal for a long long time. Thank god we found this town for our great experience with totally traditional great northern Greek dishes. 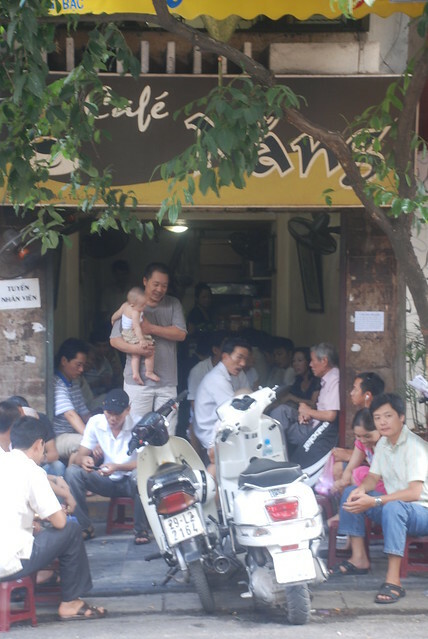 Pickpockets and other kinds of scams are common-place in Hanoi these days. One of the most prevalent scams in Hanoi is the professional charity collectors. This is what happens; there are two people, the girl dresses up nicely and speak English quite well, and the man rides the motorbike. They always look for single middle aged tourists. They carry a book with a long list of western tourists and the number of dollars they have donated, of course with signatures. They have cheated so many tourists in Hanoi. Last year, I met an American woman in Siem Riep who told me about a young girl who approached her while she was in Hanoi, using the same story. When I told her that it was a scam, she was horrified. I've witnessed the scam myself. Yesterday, when I was buying some food for my dog near the Dong Xuan market, I saw a girl speaking with a young male tourist. Finally, she got what she wanted but further drama followed. The tourist gave her some US dollars and there was a $1 note which was a bit old and she refused to take it, asking him to change the note. He didn't have another note and she tried and tried for about 10 mintues but the guy refused to give her a better note. She actually got angry with him, jumped on the back of the motorbike and took off. 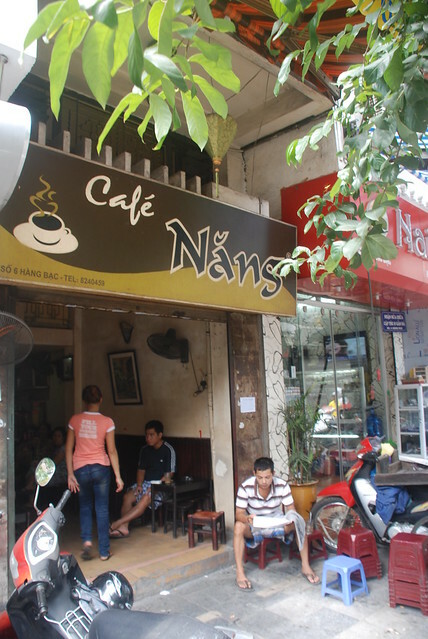 Today again, when I was having my regular coffee at Cafe Nang in Hang Bac street, I saw a very young, pretty girl doing the same thing to a young guy but after 10 minutes trying he kept refusing. She was very mad, said something in Vietnamese which I couldn't hear then sped away. Fruit sellers in the old town are another annoying night mare to tourists. There is a group of young women who carry small amounts of pineapples and bananas. They try to put their baskets on the shoulders of tourists, thinking it would be a good photo, then force them to buy their fruit at an exhorbitant price. They often charge $3 for a small bag of pineapple instead of 50 cents. Sometimes, these women shout at the tourists when they don't get their own way. Occasioanlly, other old quarter residents shout at these scammers to leave the tourists alone, some even threatening to call the police. Everybody needs to work to earn money but these kinds of scams give Hanoi and Vietnam a bad name. The local authority really should do something about it. I promise myself that I would take my mother to one country in South East Asia every year and I have been doing it for the last 3 years. My brothers and sisters also contribute some money for the trip and I'm more than happy to take my mum with me. She has been to Malaysia, Singapore, Thailand and this year I took her to Angkor Wat - Cambodia. 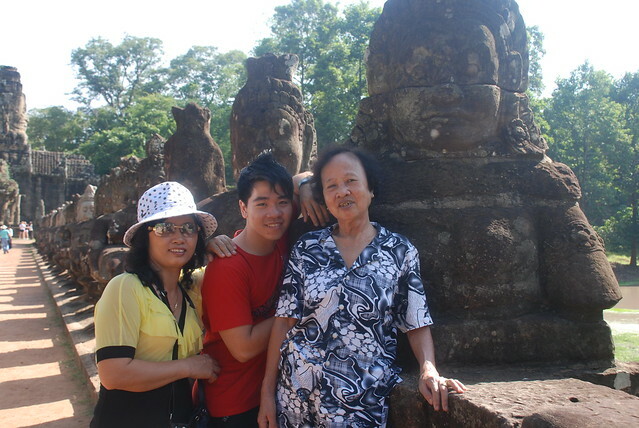 As with other trips, Minh, my sister joined us along with my nephew, Phong. We arrived in Saigon from Nha Trang at 5.30 am and we took a taxi directly to Tan Son Nhat International Airport as we were leaving Saigon at 9.45 am and my family were so worried about missing our flight. Anyway, we didn't, and arrived in Siem Reap after about an hour flight. I could see from their eyes that my family were very excited about being there to discover one of the most famous world heritage sites in the world. We got picked up by the Central Boutique Resort staff. The very warm welcome and big smiles from the staff made all of our tiredness disappear. 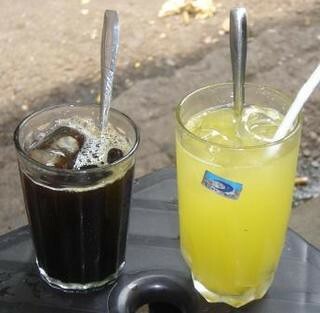 The hotel is centrally located, about 7 minutes walk to the night market and pub street which is very convenient. 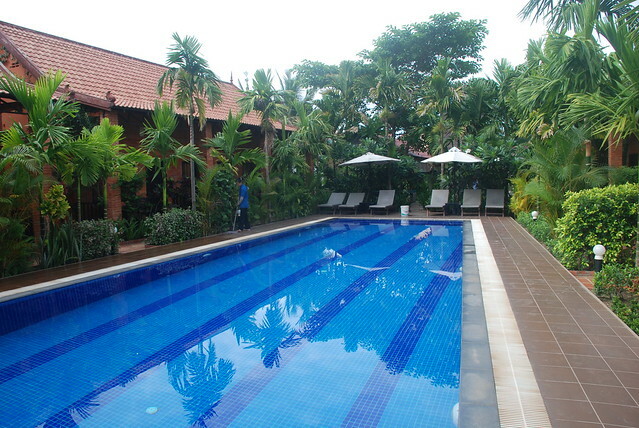 I loved the resort's pool and the welcome drink of tea, the sweet staff and the strong free wifi. My nephew and I decided to jump into the pool after checking in to refresh ourselves. So cool! We had lunch at the hotel and I was very impressed with the presentation of the food. I never saw a sour face from any of the hotel staff either - the whole time we were there. No wonder the hotel is busy most of the time!!! I felt bad that I didn't use their tour services but I had already booked a tour guide whose services I had used last year, Mr Sopheara Pheav. He is one of the best tour guides in town, charges a very reasonable price, speaks good English, and has good knowledge about his great home town. 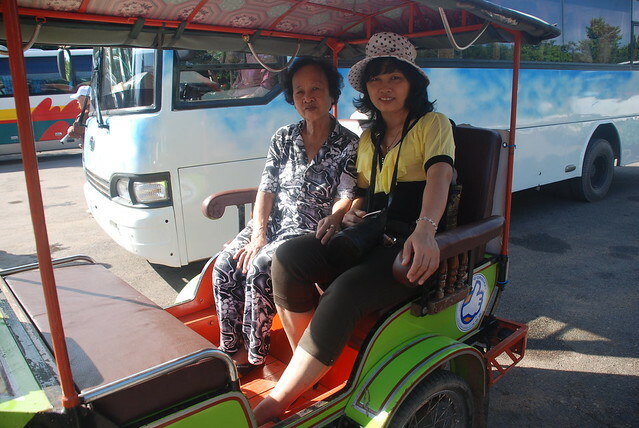 My family loved travelling around by tuk tuk especially since my mother and my sister get car sickwhen they go by regular car.The tuk tuk also allowed us to have a really good look at the surrounding scenery as we went along. Anyway, Pheav met us on the first afternoon as we planned by email to discuss our tours the next few days. I didn't really want to do a tour everyday because my mother is over 70 now. 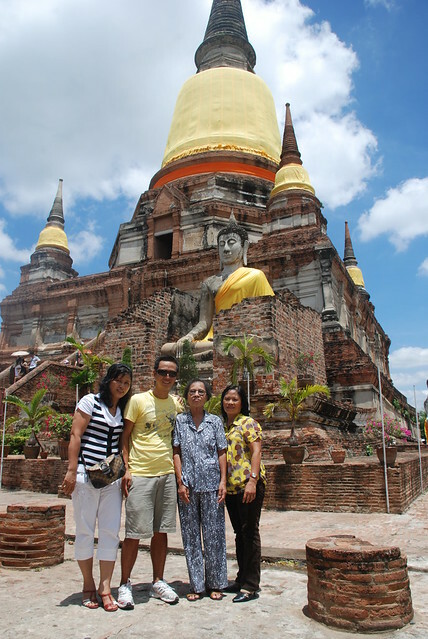 I wanted to see her enjoy the amazing temples slowly and feel it instead of rushing around like other tourists. Pheav and I negotiated a suitable plan and he recommended that we bought a 3 day pass which cost $40 per person and is valid for a week. 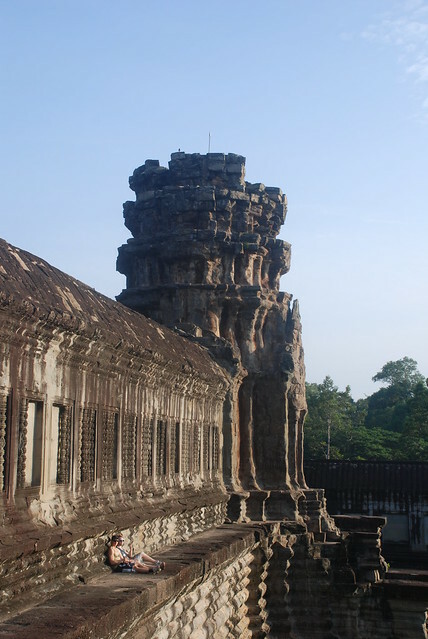 We started out journey the next day to see the sunrise and my favorite Bayon temple.